Learn how to talk about personal grooming and hair care in English with this Advanced English Phrases video lesson! 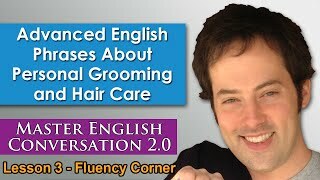 In this sample Master English Conversation 2.0 Fluency Corner video lesson, you’ll learn lots of great phrases, that will help you express yourself in more detail while talking about personal grooming and hair care for men and women in English so you can have better English conversations. Enjoy this Advanced English Phrases lesson video about personal grooming, and let us know what you think in the comments! 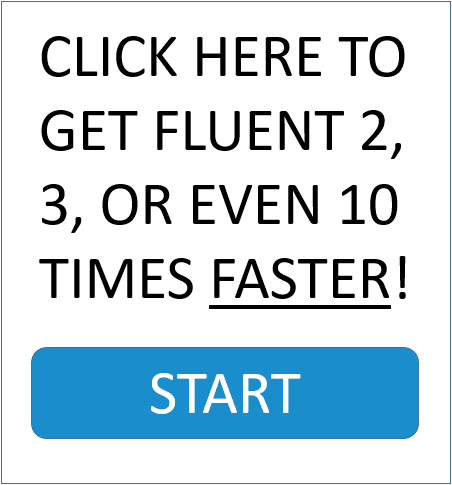 And welcome to this month’s Fluency Corner lesson. It is a pleasure to see you again. I hope you’ve been enjoying the lesson set so far. and then that’s where you go get your hair done. So, when you talk about doing that kind of thing we’re going to be learning all about that in this lesson. Now this is coming from landscaping, where you take your garden and you make it look beautiful, or any kind of dirt and you put trees and shape the dirt. when you’re a man that’s, you know, cleaning up his face and doing other things. piercings and other tattoos, and doing interesting stuff with their hair. So, more people are trying to, you know, they’re taking more care of themselves, and that’s why I’m thinking about, well maybe I should do the same thing. in the, in the same way you know, that’s what manscaping is. and the first one is just looking at my beard right quick now. This is about maybe two or three days worth of growth. and even though this is a little bit long at, uh, you’ll see in the conversation when I talk about having five o’clock shadow. slowly, slowly, slowly as the day goes on. And then by five o’clock, your hair is, like, kind of, growing out, and you’ve got a little bit of a shadow here. Next is a receding hairline. grammar focused lesson it doesn’t come quickly it creeps back. So my hairline is creeping back. So, some men they get bald, you know, in the back of their head first and it creeps forward. But in my case it’s kind of creeping back. So, maybe I will go bald, maybe I won’t. that I talk about wanting to shave it all off. So, I’ve never seen that before, but maybe you can tell me if that would be a good look or not. So, this is to, uh, have a hairline that’s receding, to go back, to recede. you can have a, uh, a wig, or a toupee. This a kind of a hairpiece, and we can also just call that a piece as I say in the conversation. So, I talk about, maybe, if I lose all my hair I’ll get a piece. uh, that’s maybe like a $500 or $1,000 piece of hair, and you can’t tell the difference that’s a nice toupee. So, that guy has a rug on his head, a rug. Next, the barcode and the comb over. So, sometimes men you know, they’re going bald on the top. We talk about being bald on top. but not on the sides. So, the hair will recede, it will go back, and then you’ve got the hair growing out here. And then you take this hair and comb it over. So, you take a comb and comb it over that way. you know, like a product whenever you buy something it’s got that little square with the black lines on it. So, it looks like the hair going over your head like that. so this is to comb your hair over this, and that’s the noun, also a comb over. Or you can have a barcode. Next you’ll see me mention this in the conversation, having good genes. uh, ideas, the data that’s passed down that comes from your parents. So, maybe if your parents have good teeth then you will have good teeth also. I actually have bad teeth. so that way it kind of straightened them out a little bit. But I’ve still got very bad teeth in my genes, so maybe my children will also have bad teeth. It’s a good thing my wife has good teeth though. you know, they’re getting attractive traits. blue eyes or strong hair, or thick hair, or long hair, or yellow hair, that kind of thing. Or being talk, or short, or fat, or thin. These are all things that are coming from the previous generation. So, these are your genes. or when you talk about a baby that’s looking very cute the baby must have good genes. and you can also call this a cowlick. Think about like a cow with a big tongue licking your hair, and it, kind of, puts it in a weird direction. you’ll see it more, uh, if you look in the grammar focus lesson you’ll see maybe the back of my head. and many people have this. The hair goes and grows in a certain direction. So, this is called a colic. So, it’s just where the hair comes and spins in a different direction and maybe stands up a little bit. but because they often have longer hair the hair will come out and then it will flow down their head. And it’s weighed down so they can’t really see that little bit sticking up. or does the man make the clothes? And you can use this for women, does the woman make the dress, or does the dress make the woman? And either does, it just means does a good looking man make a nice suit look better? Or does a nice suit make a, maybe, not so good looking man look better. but it’s just saying is the beautifulness or the beauty of the person better than the beautifulness or the attractiveness, uh, of the suit. so does the man make the dress or does the dress make the man? Or I guess maybe that’s for women, or maybe a man if he wanted to wear a dress, I suppose. Okay, now let’s get into some words specifically about hair, because you’ll hear a lot of these also in the conversation. We talk, one, about having split ends. but if you imagine a piece of hair, bink. I pull one hair out, and it’s a long string like that. The part that’s at your head it’s still together. uh, or you don’t wash it and keep it nice then that, the ends of that they split. you know, different little pieces like that. So, this is the ends of your hair, they split off to have split ends. So, when you go to a barbershop you usually get the ends of your hair cut off. You can also talk about having tangles. things are mixed and they’re kind of like, uh, a knot. They can’t really separate them, and this is when your hair is all tangled together. Now my hair is very short, so I don’t really have that problem. it can get tangled together. coming together and knotted up like that, tangled. And the last piece here is just talking about the front of your hair that comes down here. This is called your bangs. So, I don’t really have much in the way of bangs either. Usually, again, people with longer hair maybe they will have some bangs that come down and cover their face. But it’s just the hair that comes down over your eyes. So, this is the top, the sides and the back and there is really nothing special about these words. It’s just the top of your hair, the sides of your hair. Or, maybe, there is but, uh, it’s maybe something very specific for people that work professionally in hair care. But the thing that most people know regularly is bangs. So, when you go to a barbershop and you say oh please trim my bangs a little bit, my bangs. Now, we’ll go into some things for facial hair, and that’s why I have my lovely little bit of a beard going on here. uh, this is maybe two or three days of growth; it’s coming out just a little bit. It’s not a really thick full beard, so this is stubble. So, when the hair, uh, when you have nothing on your face you are clean shaven. from the morning to the afternoon you have five o’clock shadow. And then after that you’re moving into stubble. So, this is, kind of, a style for some men. You would even take a, a, uh, a beard trimmer or a clipper, and then go over that. And then try to keep it at this length, because that’s just a style for some men. For me I just wanted to leave it growing out. I usually have, uh, clean shaven hair because my wife prefers it that way. And also it gets itchy. I want to scratch it like this. so this is just for this video really. So, you can see me with a little bit of stubble. having longer sideburns like this, this is what was in style. Now maybe it’s kind of in style. It’s kind of not. It depends. um, but I like having these. Maybe, it’s ‘cause I have a long, I have kind of like a long peanut head. So I don’t know, I think maybe the, uh, the sideburns here just compliment me like that. So, that’s what I have. and go down, and it would be really, really thick at the bottom. These are called muttonchops, and you’ll hear this mentioned in the conversation as well. So, just like a piece of like lamb chop, because it looks like that same shape. So, lamb, like a piece of lamb chop, like you would eat. a full beard, a regular beard. So, I’m not putting any style on it. maybe put some, uh, some white dye, some white hair coloring in that. So that’s a full beard. But if I shave this all off, I shave from here, I, I shave my sideburns and just have, uh, just this up here that is only a mustache. Now, this is a difficult hairstyle to have. uh, and that’s a good style for some men. It kind of looks a little weird on me, but maybe I’ll try that someday. but just the soul patch like that. uh, the hair going around your face like that. uh, this. And you can say uh, like let’s say I have a full beard like this now. I have some stubble here. I cay say uh, leave the mustache. So, if I got to the barbershop, and I say you know, I’m gonna get a shave I say leave the mustache. It just means don’t shave this part. So, shave everything else, but leave the mustache, or leave a goatee. but leave the mustache and this part going around like that. you can also get manicures and pedicures. ped is the prefix for feet. other things like that on your feet, that’s a pedicure. And to get them together this is often abbreviated as a mani-pedi. I’ve never had either of those, but maybe one day I will try that. And one last thing is a facial. peel that away and, you know, kind of clean off all the skin that’s on your face. I tried one of those. and these are things like shampoo, conditioner, lotions, other things like that. I don’t want to give you specific examples because it wouldn’t really help to show you what they look like. so we’ll just talk about how they work. The first one is shampoo and then we’ve got conditioner. Now this is the most basic kind of hair care stuff that many people use. Shampoo is something we wash our hair with. This cleans the hair. And then we’ve got conditioner after that. 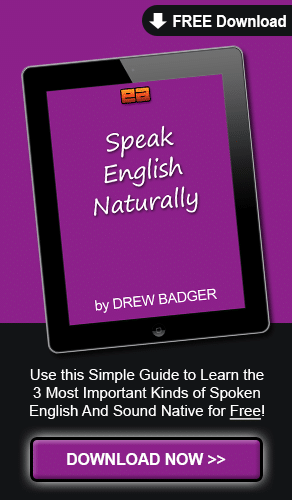 uh, and more like a native speaker. So, we’ve got shampoo and conditioner. Sometimes you can find them together in a two in one. shampoo and conditioner, it just means they’re both mixed together in the same bottle. You can also get regular oil. You’ve got like oil for your beard, or oil for your hair. make it nice and beautiful. and this is what you use especially in the wintertime when the air gets a little bit more dry. You want to keep your hands and skin generally moist, and I actually don’t really do much of that. I kind of get in the shower, wash myself very quickly. I don’t think I use, no I don’t really use conditioner. Maybe I should, I don’t know. I’ll find out. If you think conditioner is a good idea for me I don’t really care, maybe my hair is not so important like that. But that’s these basic things. Next are products specifically for men, or women that feel like shaving. You could shave your legs with these, or shave you know, under your arms or something I suppose. The first one is just a shaving oil, and this is usually something you put on your beard. as you’ll see in the conversation when Ron is talking about that. you use some kind of shaving gel, or shaving foam, or shaving lotion. mix it with a little bit of water, and I whip up a lather. And then put this on my skin. So, I take a shaving brush as you saw in the grammar focus lesson. And then I apply that to my beard, maybe once or twice, and then I get a nice clean shave. razor is kind of pulling your skin a little bit. for the razor to move over your skin. As far as smelling nice you’ve also got aftershave. This is what you, after you shave you apply this to your face, and maybe some of them have a smell. you can get unscented, unscented. So, a scent means a particular smell. So, you can get unscented shaving lotion, or oil, or anything else. And then you can also get deodorant and antiperspirant. Now these are two different things. Deodorant means you actually put it on your, on your skin under your arms or anywhere else that you know, it gets kind of smelly, you know, you know what happens when you work out or you spend the day in the hot day something like that. So, to deodorize something, the odor is like a bad smell. So, to deodorize something is to remove or to cover up the bad smell. So these are things like you spray, tsss, in the bathroom, that kind of thing. So, this is a deodorant. The other is an antiperspirant, so to perspire means to have sweat coming out. So, an antiperspirant is actually, kind of, blocking the sweat so it doesn’t come out you know, under your arms or whatever. So, depending on what you like either you want the sweat to come out and you want to cover the smell, that’s a deodorant. Or you want to just stop the sweat coming out and stop the smell coming out all together, that’s an antiperspirant. you will get the practice in listening to that and you will improve your pronunciation. and then you roll it on to your skin. And you can also, tsss, tsss, spray on a little bit as well. Now, for specific scissors, if you’re at the barbershop or if you’re taking care of your hair at home, you’re got regular scissors. scissors or sheers, these are just regular scissors that you cut your hair with. A thinning scissors is the one, it looks like a scissors with a comb on it. so my hair it gets really thick on the sides and thinner on the top. and cut those up as well. um, actually a battery powered one or one that plugs into the wall. And that’s what goes over your face. So, you saw me getting a clippers or a trimmer going over my, uh, face. You can call it either one. And, finally, a few quick things about razors. your beard, or the back of your neck, something like that. This is called a straight razor shave. So, this is actually quite dangerous, and most people don’t shave with these at home cause you can really cut yourself with it. So, because of this a lot of people at home shave with a safety razor, because it’s more safe. So, this is where you put a blade inside of a little protective razor and then you shave with that. and the put a new blade in and then begin to shave with that. So you don’t throw the whole blade away like you do with a disposable razor. Now, again, to dispose of something means to throw it away. So, you’ve got a straight blade, it’s kind of like this. Most people don’t have these at home, and then a safety razor, which is nicer. And then you’ve got the disposable razor after that. Also some people have an electric razor. You can use a kind of a electric trimmer or an electric razor, and that’s where you can, zzzz, actually go over your hair with that. I find that it doesn’t give me a very close shave. I prefer a safety razor or a straight razor shave to an electric razor. Now, here are specific phrases you can use when you go into a hair stylist, or a barbershop, or a salon. what would you like us to do with your hair? Or, how would you like it done? Or, how would you like your hair cut? Or, what would you like us to do today? Or, what shall we do today? how would you like your hair styled or cut? Now, you can ask them, what do you do here? So can you do perms? Can you do a straight razor shave? you need a certain license to actually do straight razor shaves. It depends on where you are. and that was kind of many years ago. It was a uh, kind of short haircut with short bangs all the way across. It was like the Julius Caesar haircut. You can say make me look like George Clooney, or make me look like Brad Pitt, or make me look like, you know, Celine Dion or, you know, whoever, if you’re a woman. please make me look like this, or I’d like this hairstyle or this haircut. Now, if you don’t have a specific style in mind and you just want to talk about your hair, this is what I do. so the top, the sides, and the back. So, when you just say, uh, me, you know, I go in and I get a short haircut. I just say, take a little off the top. So, take means to cut, so I’m taking some of the hair away. or you can fade it up. This means it’s, kind of, short and getting a little bit longer and longer up here. or a gradual, uh, amount of hair as it goes back up. So, really, uh, you can kind of design your hairstyle like that. Or you can just ask them to you know, decide for you. Sometimes I go in and I say, hey you are the professional. Give me what you think would be good for my face. So, what do you think would be good for my face? Because I don’t know. They’re the professional. They know how to do that. But these are all things you can ask, so again the top, the sides, and the back. And then just asking, you know, what kind of services they offer. And, finally, here are some phrases you can use when you’re talking with people and you notice that they have a new hairstyle or a new look. This is what we call a new do, or a new hairdo. And especially for women, a hairdo. and women have more of a hairdo. So, for a man you can say, wow I like the new haircut. Or, did you get a haircut? when you’re talking with people and you notice something maybe you don’t want to say you know for sure. You know, it’s kind of like looking at a woman and saying oh, I didn’t know you were pregnant. But maybe you know, she was just, like, a little bit bigger or something like that, and that can get you in trouble. I love what you’ve done with your hair! I love what you’ve done with your hair. Or that’s a really nice look for you, that’s a really nice look for you. So, it’s always great to appreciate the changes that people make because it shows that you care and that you’re noticing what’s happening to them. Some people, they have no idea. they might get a little bit angry at you. If you see, you know, your girlfriend even a little bit different you can say, did you do something different with your hair? Did you do something different with your hair? it still shows that you care and that you’re paying attention. Well, that’s it for this lesson, I hope you have learned a lot. especially when you go to a barbershop or a salon and you’re asking for these things. Or, when you’re, you know, just watching the Master Class video lesson and you see how all of these things come together. and then I will see you in the conversation very soon. Have a fantastic day, bye bye.